The Zetec oiling system is pretty simple. The pictured version is as revised in June 1013. Other than the oil pan which is pictured here it involves a few Canton oil system parts and some AN-10 aramid-braided hose and fittings (from pegasusautoracing.com). The aramid hose was installed June 2013 along with a major revision of the oil system for simplicity, light weight, and lowering the center of gravity. The aramid-covered hoses are pretty easy to build as compared to steel-braided hose: no special tools are needed for the aramid hoses. The hose itself is about $2.50 per foot and the fittings around $80 each. I did have to make one of the hoses three times to get the length right. It was a good thing I did not attempt to have the hoses initially made up professionally as I would have got it all wrong. The blue cannister is the Canton oil filter. The Canton filter is pegasusautoracing part 1281. The filter clamp is part 1285-SQUARE, and the oil filter element is Pegasus part 1292. There is a fitting at one end of the filter (not visible) which is an oil temperature sender (I added an oil temperature gauge in 2007). 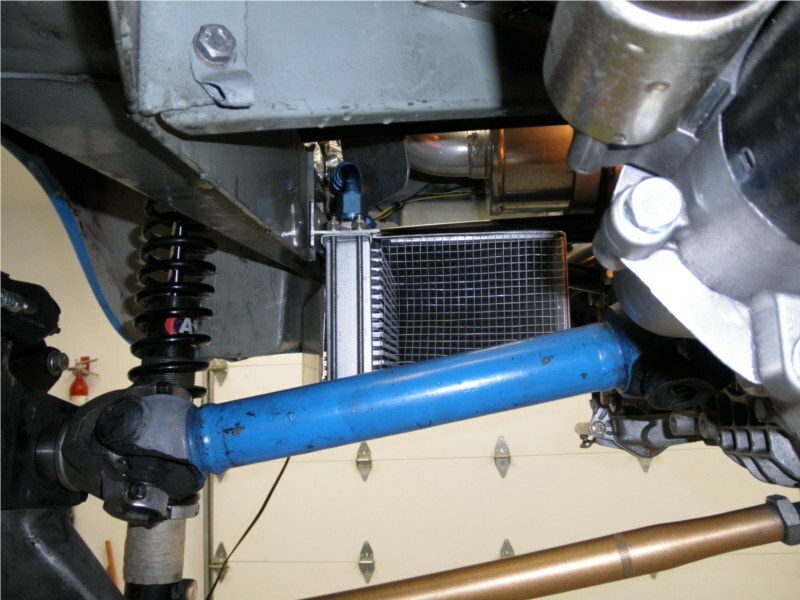 Here is the oil cooler itself in a slightly older photo with the previous oil lines, looking from the front of the car toward the right rear. The Canton adapter (Canton 22-595) bolts to the oil filter connector on the block. It's heavier than the special aluminum adapter pegasusautoracing sells, but the Canton part does not stick out very far, which was crucial for the (short time) I was mounting the engine electric water pump in the chassis rail next to the adapter. The Canton oil-cooler thermostat is no longer present. Removed it in June 2013. It would make the system considerably more complicated and (after using a thermostat controlled system for a year) I decided it was not really necessary given the way I use the car. In addition, the Davies-Craig cooling system gets the water temp up decently quickly which in turn helps the oil temp get sensible. 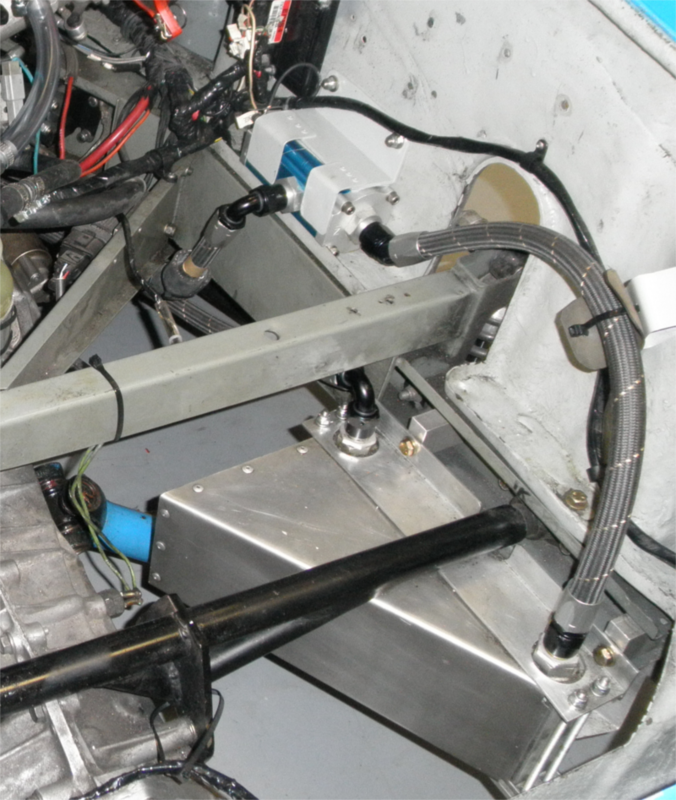 The oil cooler is mounted parallel to the frame and ducts route air into and out of the cooler. I used tufts of yarn and took movies before the cooler was installed and verified there was air flow there. With the cooler installed I took more movies and verified that at 60 MPH significant amounts of air go through the cooler. At the first track day (admittedly a cool day) the oil temperature stayed much cooler than it would have before the cooler was installed. On a 95 degree F day the oil stayed around 190F even when the water temp was getting out of control (the cooling system not adequate as of September 2012). 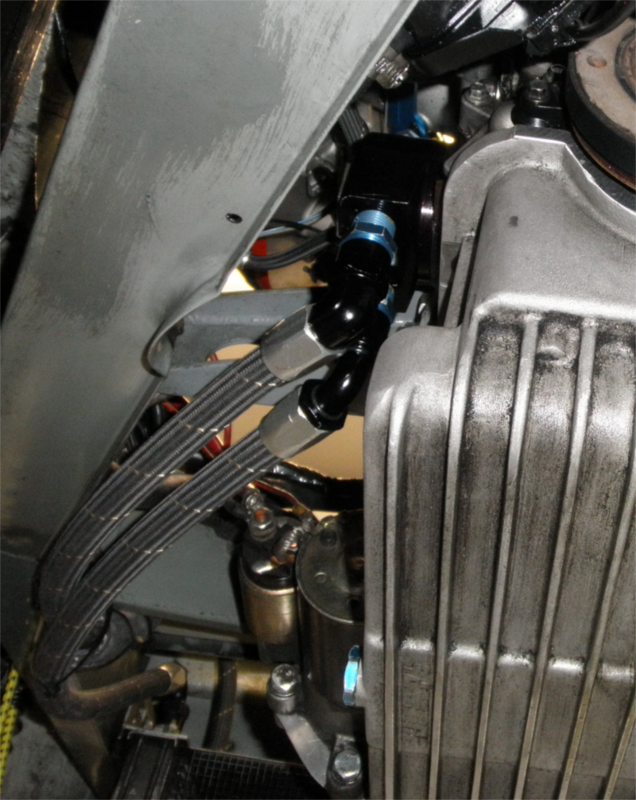 The rounded-look black Canton adapter routes the oil around a 90 degree bend (internal to the adapter) and to the oil hoses. 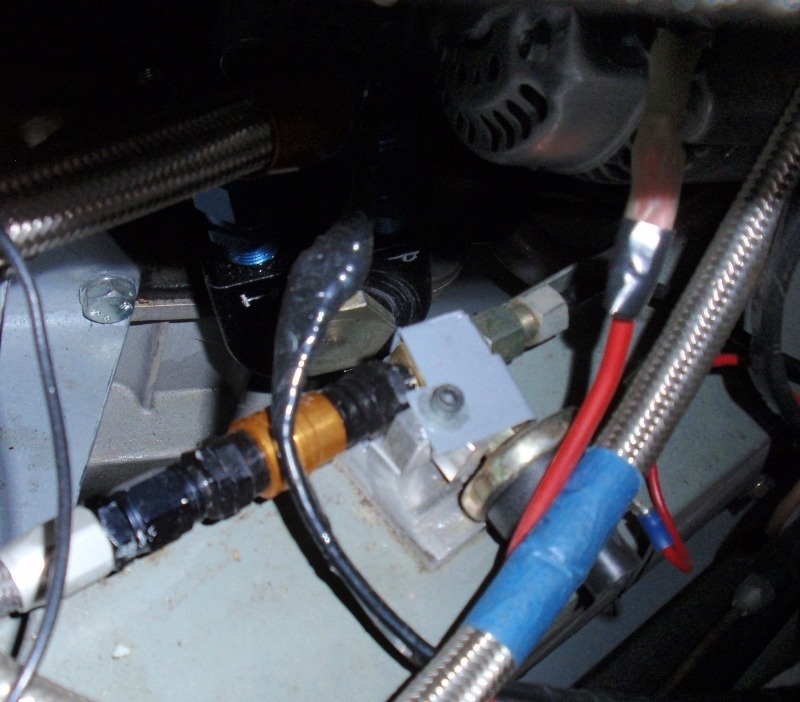 The small line (above the adapter and looking like it comes from the adapter) goes to a dry-break fitting here and thence to a small tee fitting so I can have a standard oil pressure gauge and also a red idiot-light on the dash to warn of low oil pressure.